The car has too much power in our lives and in urban planning. It is a great source of pollution, it takes up a lot of space and it creates distance between people, which leads to conflict and disagreement. It is time that we take control, and put people first in urban planning. But that off course challenges the way that we live today. We need to take a god look at what is important, and what better place to start the people’s revolution, than the former Motown city, Detroit. The rapid urbanization and construction of roads left us with very little green space in our cities. Sustainable urban planning is also about mixing nature with the build environment, for the benefits of both people and the global environment. Research shows that when people live in close proximity to parks and green space, it reduces stress-related diseases with more than 50 %. Our main goal is restoring the damage made by humans, to the global environment. If we want to reduce the carbon footprints, we need to go back to basics. We need to see the importance of living in proximity to were we work, what we eat, were we go to school and everyday life in general, so that we can walk, bike, and use public transportation instead of cars. By making the city walk- and bike-able, we are also making a sustainable city. We need to learn to eat what can grow in our own climate, so we don’t have the need to import vegetables from distant countries. The creation of six new neighborhoods in and around each ‘flyover’ is based on the idea of urban farming and collaborative thinking. Urban farming is Green Growth. But it is about more than ‘just’ farming. It is also about people realizing that when we work together and get involved in every aspect of our own life, we create ownership and responsibility. Growth is about something more important than economical growth; it is about mobilizing people skills, power recourses, and knowledge. 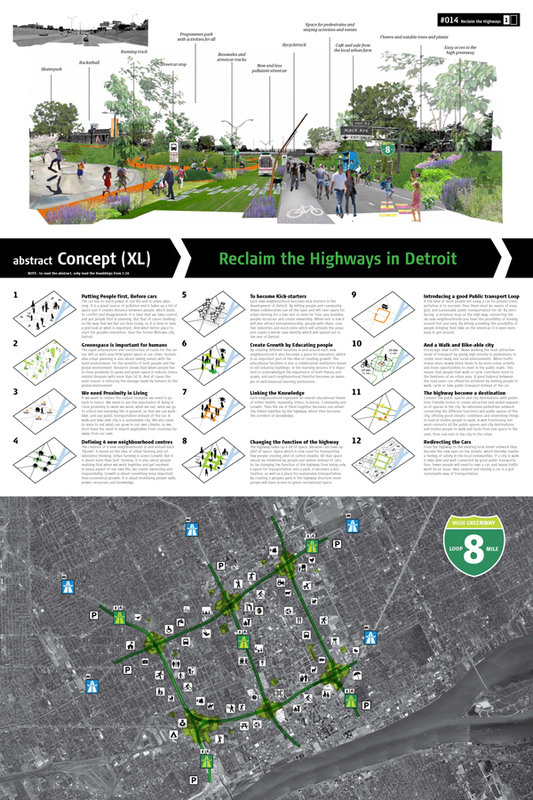 Each new neighborhood becomes kick-starters, in the development of Detroit. By letting people and community-driven collaborative, use all the open and leftover space for urban farming with low rent or even for free, you mobilize people recourses and create ownership. When rent is low it will also attract entrepreneurship, people with ideas, student projects, creative industries and much more which will activate the areas and create a whole new identity, which will spread out to the rest of Detroit. By creating different faculties in and around each new neighborhood it becomes a good place for education, which is an important part of the idea of creating growth. The educational faculties, is also a collaborative institution based in old industrial buildings. In the learning process it is important to acknowledge the importance of both theory and practice, and each neighborhood therefore becomes an example of a well balanced, learning institutions. Each neighborhood, represent an overall educational theme of either, Health, Humanity, Ethics, Sciences, Community or Growth. Then the six of them together becomes one university linked together by the highway, which then becomes the corridors of knowledge. The highways and cars take up a lot of space, which is used for transporting very few people. This is producing massive amounts of carbon dioxide, especially compared to the benefits it is giving. 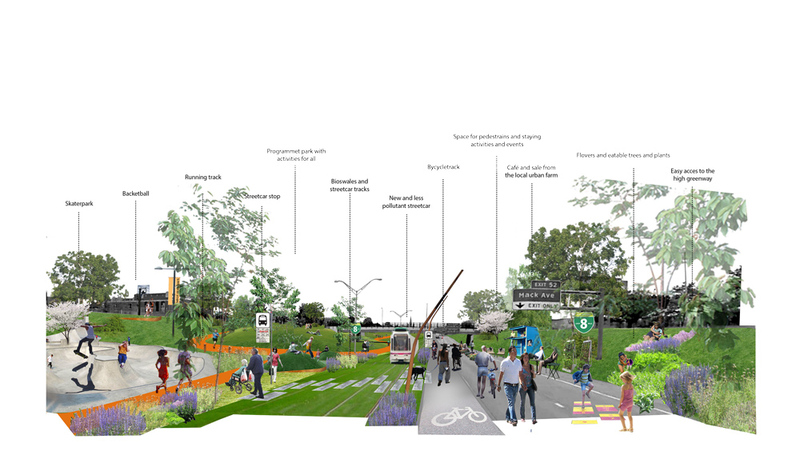 We can reclaim this space, and fill with people and nature instead of cars, by changing the function of the highway, from being only a space for transportation into a huge green area intertwined with public transport, in form of a city-loop, and several bike lanes. The new highway is no longer about the journey but it is the destination it self. 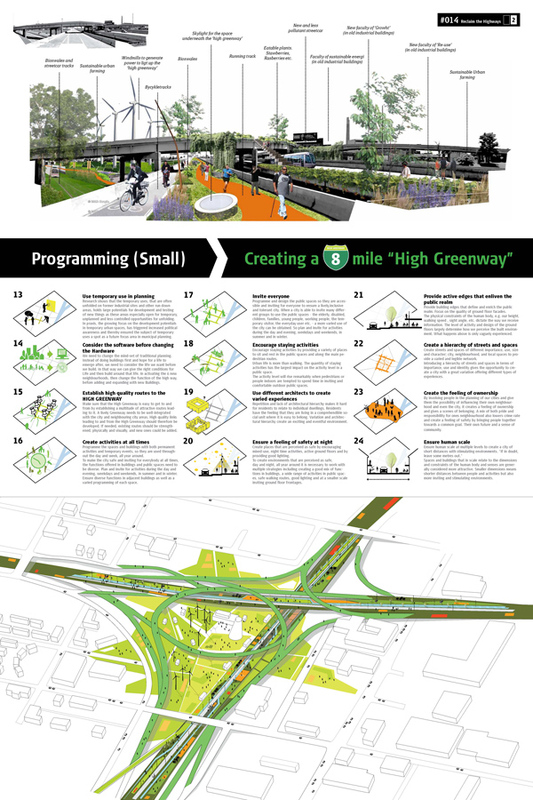 One way of activating the high greenway, along with the city loop and bike lanes could be a series of temporary use facilities, developed by the citizens, to involve them in the process, and create a sense of ownership. Temporary use space, are often unfolded on former industrial sites and other run down areas, and holds a large potential for development and testing of new things as these areas especially opens an opportunity for temporary, unplanned and less controlled ways of unfolding the city. In praxis, the growing focus on developing potential temporary urban spaces, has triggered an increased political awareness and thereby ensured that the subject of temporary use remain a focus point in future municipal planning. We need to change the mind-set of traditional planning. Instead of putting focus on buildings first, and hope that life will emerge, we need to consider the goal we want to achieve, before we start building. In that way we can give the right conditions for life and then build around and in collaboration with that life. In activating six new neighborhoods, and change the function of the high way, we can better acknowledge the best way of adding and expanding the area with new Buildings. Making sure that the High Greenway is easy to get to and from is important. We hope to achieve this, by establishing a multitude of attractive routes leading to it. 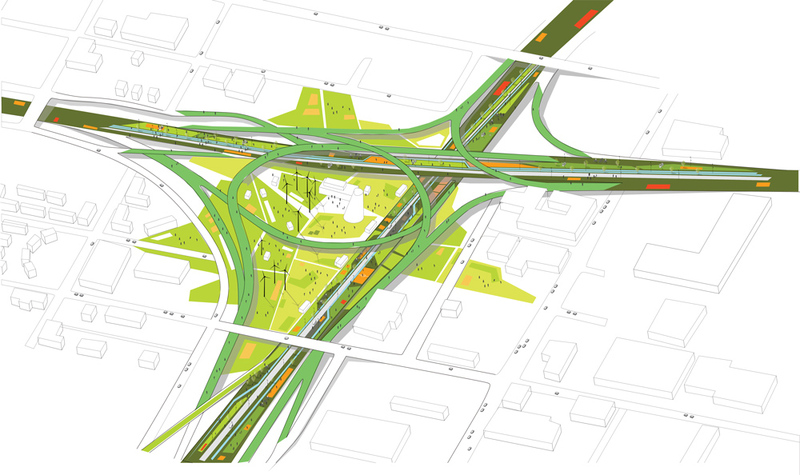 A lively Greenway needs to be well integrated with the city and neighboring city areas. High quality links leading to and from the High Greenway should therefore be developed. If needed, existing routes should be strengthened, physically, visually, and new ones could also be added. The space and buildings should be a mix of both permanent activities and temporary events, so that they are more likely to be used throughout the day and week, all year around. To make the city safe and inviting for everybody at all times, the functions offered in buildings and public spaces must be a wide range. Involving the citizens with setting up plans and events that encourage activities during the day and evening, weekdays and weekends, in summer and in winter, will ensure diverse functions in adjacent buildings as well as a varied programming of each space, in interest of a diversity of people and age-groups. By programming and designing the public spaces, in collaboration with the inhabitants, to make them accessible and inviting for everyone, it can ensure a lively, inclusive and tolerant city. When a city is able to invite many different people with different needs, to use the public spaces – the elderly, disabled, children, families, youth, workers, tourists, the everyday user etc. – a more varied use of the city can be obtained. Providing a variety of places to sit and rest in the public spaces and along the main pedestrian routes are important, urban life is more than walking. The quantity of staying activities has the largest impact on the activity level in a public space. The activity level is more likely to rise, when pedestrians or people indoors are tempted to spend time in inviting and comfortable outdoor public spaces. Repetition and lack of architectural hierarchy makes it hard for residents to relate to individual dwellings. Residents have the feeling that they are living in a comprehendible social unit where it is easy to belong. Variation and architectural hierarchy create an exciting and eventful environment. A city cannot be based on one person’s vision. Jointly we can create a diverse city, in addition to bringing new life will be perceived as safe by encouraging mixed-use, night time activities, active ground floors and by providing good lighting. To create environments that are perceived as safe, day and night, all year around it is necessary to work with multiple strategies including and create a good mix of functions in buildings, and a wide range of activities in public spaces. Provide building edges that define and enrich the public realm. Focus on the quality of ground floor facades. The physical constraints of the human body, e.g. our height, walking speed, sight angle, etc. dictate the way we receive information. The level of activity and design of the ground floors largely determine how we perceive the built environment. What happens above is only vaguely experienced. Create streets and spaces of different importance, use, size and character, city, neighborhood, and local spaces to provide a varied and legible network. Introducing a hierarchy of streets and spaces in terms of importance, use and identity gives the opportunity to create a city with a great variation offering different types of experiences. By involving people in the planning of our cities and give them the possibility of influencing their own neighborhood and even have an impact on the city it self, creates a feeling of ownership and gives a sense of belonging. A mix of both pride and responsibility for ones neighborhood can lower crime rate and create a feeling of safety, by bringing people together towards a common goal. A question that needs to be considered regarding this proposal: is the city and its inhabitants are ready, and open for a change of this scale to the infrastructure, and how this would affect access to and from the city? If you are dependent on a car to get to work, visit relatives, or whatever your destination, this may not seem like a preferable solution. To change the mindset of a whole city, taking one small step at a time may be the right way to go? Or rather start by re-activating and reprogramming abandoned, or neglected sites. This way we are able to set an example of how we can, together, recreate the city, at a bigger scale in the future, and get a clear insight into what works and what doesn’t work in this particular city and community. The proposals chosen in this competition were all concentrated interventions on a smaller scale, suggesting how little changes to the neglected existing can make big changes, and have a great impact on how people interact in a city. This is something that needs to be taken into consideration in future projects. In some cases simplicity is key, in addition to proximity.